Atlas of Poetic Botany by Francis Hallé with Éliane Patriarca, translated by Erik Butler, 2018. The MIT Press. G: All of the above? The answer is G. Poetic Botany is that rare thing, a book that works on several levels, and for which the whole is greater than the sum of its parts. As an academic, Hallé has spent a life-time studying the plants of tropical rainforests. As a well-travelled scientist, he brings to the book global appreciation of the intricacies of the biology of those ecosystems. As a communicator, he has the gift to produce text that is readable, accessible, thoughtful, and interesting, which is always nice to see – and even nicer to read. I don’t know how much travelling he now does as an emeritus professor at the University of Montpellier, but he clearly continues to think about, and write upon, tropical botany matters; Poetic Botany is his – the? – latest contribution to the literature on that topic. includes Hallé’s charming drawings – which are usually coloured. The book is grouped in 5 sections: Records and exuberance [featuring the plant with the biggest leaf in the world – royal raffia, Raphia regalis]; Adaptations [including plants that are single leaves – Monophyllea insignis and Streptocarpus monophyllus, underground trees – Parinari spp. and Jaborosa spp., and a New Guinean leafless orchid – Microcoelia caespitosa – whose roots take the form of … leaves]; Mysterious behaviour [show-casing Eucalyptus perriniana whose leaves don’t fall from the tree but pile up at the base of branches forming cold-protecting sleeves for this inhabitant of snowy Australian mountains, and the chamaeleon vine (Boquila trifoliata) whose leaves mimic their hosts’]; Coevolution between plants and animals [with bat-luring Marcgravia umbellata, and the woman-punishing ‘adultery tree’, Barteria fistulosa]; and Biological singularities [featuring the rain-making Fountain tree (Ocotea foetens), and the architecturally-inspiring, thermogenic, colour-changing Victoria amazonica…], which gives some idea of the quirkiness of the entries in each section. From a marketing point of view, one suspects that this book causes the publisher some problems; Poetic Botany is difficult to characterise. It’s not a textbook, although it is eminently educational and includes many tropical botanical facts. Poetic Botany is part gazetteer, part Guinness Book of plant records, part traveller’s tales, but poetry? Although Hallé attempts to define what is meant by the botanical poetry of the book – or, rather its subject matter – in its Introduction, I’m not entirely persuaded by his ‘defence’. Nevertheless, poetical or not, Poetic Botany shouldn’t be viewed as an elegy for tropical forests. Rather it is a celebration of those verdant botanical wonders, whose text contains much of the poet’s appreciation of natural phenomena. And Hallé’s rather whimsical – although seemingly extremely accurately executed – illustrations add an otherwordly quality to the words. Despite its name of ‘atlas’, it’s not an encyclopaedic coverage of all of the Earth’s plants, but biased towards non-tree plants of equatorial forests – although quite a few trees are also included for good measure [after all, how can you extol the virtues of rain forests without including trees..?] But, for as many interesting facts that Hallé shares with us, he repeatedly reminds us that there is much more still to find out. Poetic Botany is therefore as much a celebration of what is known about tropical botany, as an invitation to get out and study these amazing habitats to discover what is still unknown. For those whose interest is piqued by Poetic Botany, there is no real indication of where to go to follow-up your newly found, or rekindled, interest in tropical botany. There are very few references in the book; I only counted four that I would consider to be ‘proper’ ones (on pp. 49, 62, 92, and 106) of the six listed as footnotes. That’s a shame because I would dearly love to know more about the old-growth, tropical forests whose “floor is covered by a layer of carbon dioxide about fifty centimetres thick”, or the bacteriochlorophyll that ‘load’ the leaf-stalk of Gunnera. Indeed, this inability for readers readily to pursue interesting facts doesn’t sit well with Hallé’s musings on the cumulative nature of science and the fact that discoveries are made but which the next generation forgets (p. 69). To prevent some of this ‘reinventing the wheel’, having enthused readers with the desire to know more, it would have been helpful to have provided them with the references to pursue their new-found interest. Overall, this is a beautiful botanical book – and a great reminder of how wonderful plants are! Whilst it might be the latest word on the subject of tropical botany, Poetic Botany surely won’t be the last – if it works as anticipated to provide a much-needed PR boost to study of this ecosystem! 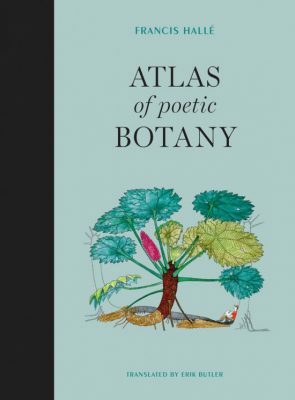 The Atlas of Poetic Botany is a charming book about tropical plants that most of us will never see in their natural surroundings. It’s therefore something of an armchair’s botanist’s delight, with easy-to-read text and wonderful illustrations. All involved in its production are to be congratulated. Previous articleDoes evidence of saltwater exposure explain recent changes in the tree communities of North Carolina’s Coastal Plain?